by David Nelken (ed). Farnham, Surrey, England: Ashgate, 2011. 228 pp. Cloth $104.95. ISBN: 9780754676812. Reviewed by Caryl Segal, University of Texas at Arlington (retired). 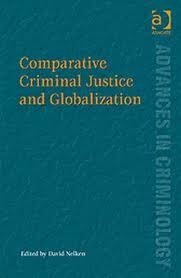 This volume opens with the statement that the theme is “to compare crime and criminal justice phenomena across different cultures and societies in the light of the processes known as globalization” (p.1). Globalization analyzes how conflicts and development in far flung localities impact local crime and security concerns. Traditional comparative studies explain differences by focusing on the individual nations. National laws and societal cultural terms are studied for their impact on the law. Unlike many verbose introductions to multi-author volumes, Nelken summarizes the various chapters in a terse but illuminating manner. In six pages, Nelken whets your appetite to read and contemplate the differences and similarities between conventional comparative criminology and the globalization of criminal justice. Political scientists, public administrators, and sociologists should find a great deal of useful material in the various chapters. Nelken authored the first chapter, which covers the current disconnect between increased punitiveness and lowered crime rates in the United States, Britain, and Wales. Unlike the United States, Britain and Wales use short terms of imprisonment. Nelken stresses the important difference between continental and common law systems with the latter’s attention being directed to the insulation/responsiveness based on political direction and/or social expectations. He opines that studying prison rates alone leads to distorted conclusions. A discussion of the changing faces of tolerance and their impact on prison rates concludes the chapter. In chapter two David Downes writes about the comparative aspects of criminology’s historical beginnings. He provides a look at English political history post-WWII and illuminates how the “tough on crime” approach became the Tory government’s challenge with the resultant dramatic increase in prison population. Downes then illustrates the effect American presidential politics have had upon prison populations. Nixon’s emphasis on law and order to Clinton’s tough on crime campaign is detailed. He also shows how British political campaigns mirrored the US with similar penal population increases. Contrasting these policies, other Western European societies developed a large welfare infrastructure and moderation in penal policies. On the other hand, Canada’s lowered crime rate occurred without the growth in penal population and thus refutes the theory that lowered crime rates result solely from increased incarceration. Moral panics, attributed to the media, are shown to have a causal relationship to increased penal populations. British Conservative leader David Cameron’s use of “the broken society” became generalized from one or more high profile crimes to the overall state of the society. Often “governing through crime” leads to a far more punitive ethos. In 1993 two-year-old James Bulger was abducted and murdered by two ten-year-olds. In response the two British political parties began to vie with one another to project themselves as being more “tough on crime.” “Prison Works” became the Tory Party’s Convention slogan. In spite of a falling crime rate, 2009 found Britain and Wales with nearly doubled prison populations compared with the 1970s. Distinguished from the “culture of control” found in Britain and the United States, the Netherlands has maintained a low prison population, albeit with a rising crime rate. The Netherlands underwent depillarization, ending religious and ideological segregation, and some theorists find a causal link with the unusually steep rise in crime: The 1989 International Crime Victims Survey surprisingly found the highest crime rate worldwide was in the Netherlands. However, the survey has been criticized for its flawed methodology, since Belgium also underwent depillarization, but without a rise in the rate of imprisonment. Penal moderation also results from a viable alternative such as restorative justice. Downes discusses the pros and cons of restorative justice in concluding his chapter. Chrisje Brants’ contribution compares the criminal process as part of a legal culture. Comparisons require knowing what questions to ask and whether the answers mean the same thing in different cultural contexts. In translation the cultural context may be lost. She reminds readers of the importance of legal cultural issues and subtleties as a means of understanding the different notions of fairness that are found in comparative studies, and in her conclusion illustrates comparative problems with a focus on the difference between the adversarial and inquisitive systems in her conclusion. Joachim J. Savelsberg discusses punishment related to globalization in Chapter Four. His major emphasis is on local adaptations to global changes. He considers mass media, and various religious beliefs and penal policies, as well as the role of academics, in penal policy. While crime occurs across all nation-states, comparative globalization studies reveal that local culture will heavily impact penal law and punishment policies. In his chapter’s introduction, John Muncie opines that state sovereignty is often challenged by international courts, human rights conventions, cross-border policing and other global groups. Japan with its cultural collective responsibility has one of the lowest incarceration rates in the world. In 2000 Japan lowered the age of responsibility from 16 to 14. This change increased the use of imprisonment. Muncie states that Japan which has long been associated with a policy of reintegration as opposed to a heavy reliance on imprisonment is beginning to deal with a renewed politicization of crime. He speaks of criminal justice agencies with lessened discretionary ability to use informal procedures. No information is provided to explain the turnaround except a blanket statement of “a proliferation of demands for increasing the severity of punishment” (p. 93). Who is making the demands and the reason for them remains unknown to the reader. In the book’s final chapter, Nelkens writes “[M]ost work in comparative criminal justice continues to be interested in classifying and describing different systems and does not really engage in questions of explanation or interpretation” (p. 185). Transnational justice and globalised governance are rising along with international organized crime according to Muncie; but Susanne Karstedt in Chapter 6 writes that much globalization results in failed states with local ethnic conflict and even anarchy. Failed states often become humanitarian crises and home to terrorists and organized crime. “Partial democracies” have the highest rate of failure. Karstedt’s contribution provides many reasons for the problematic nation-states highlighting today’s newspaper headlines. Rene Van Swaaningen offers an insightful distillation of current thinking on comparative research and the problems encountered when one country seeks to adopt a successful policy from another nation to its own. He also expands on the various research methods currently employed. Western ideas are no longer the sole focus of comparative research. The Internet brings new forms of borderless crime and with it the growing problem of finding the proper prosecutorial jurisdiction. In many cases cyber-crimes are little more than old wine in new bottles: chat rooms are the pick-up places of virtual reality with an added layer of anonymity. In Chapter 8, James Sheptycki discusses Marshall McLuhan’s global village and today’s reality as expressed by transnational processes. Patterns of governing through crime are becoming both more general and more transnational; Sheptycki reminds readers that as recently as 50 years ago transnationalism was a foreign concept. Today’s criminology has become an interdisciplinary study. Policing is an added focus in the chapter. Sheptycki, contrasted with the other authors, uses African and Asian examples in explaining his positions. David Friedrichs defines comparative criminology, transnational criminology, international criminology, and global criminology not only to illustrate the differences but also to show the intersections. Fredrichs introduces what he calls the crime of globalization, which he uses to discuss the way that international financial institutions have demonstrably harmful consequences for those in developing countries. He states that the alignment of these institutions with both the interests of multinational corporations and the political and economic elites have proven harmful to the Third World. He also utilizes an expanded definition of white collar crimes that transforms its meaning. Nelken penned the first and the final chapters. He uses the space to not only summarize the various author’ contributions but also to compare and contrast the positions that are taken. An excellent example is that while Downes compares nation-states as a source of data, Brandt uses systems of criminal procedure for hers. Nelken writes that “as it increasingly blurs the differences between ‘units’, globalization changes the meaning of place and the location and significance of boundaries” (p.190) Informational cyberspace and the global economy are growing to a large extent at the expense of the nation-state. “Globalization is therefore best treated as a Janus faced phenomenon whose effects are not easily classified as either ‘good’ or ‘bad’” (p.205). © Copyright 2012 by the author, Caryl Segal.